Since I’m fairly new to card making, I wasn’t familiar with MFT’s Camp Create. When the first session occurred earlier this summer, I skipped it. It seemed like a huge commitment, to make a card a day and the camp caught me off guard, not having been a MFT follower last year. This second session also caught me off guard, as I didn’t know they would do it again. But I was more prepared this time! I had all those MFT images I had stamped, colored and die cut weeks ago. AND, I had all those Distress Oxide ink backgrounds. It made the camp a breeze this time around. And so, here is my Camp Create Session 2! Day 1 card theme was Inlaid Made Easy! A co-worker asked me to make a card with the following requirements: three cats, pink and red wine. MFT Cool Cats to the rescue, with a little help with Hero Arts for the little wine bottle. I used Peek-a-boo Triple Window and Edge for the background, cut from Neenah Classic Crest Solar White cardstock. I blended Distress Oxide ink in Worn Lipstick and Picked Raspberry on the circles that were cut out, sprayed water and shimmer spray on them and set them aside to let them dry. I cut out the cloud edge from Sno Cone cardstock and inlaid it with the original cut panel. I stamped the sentiment from Cool Cats with Gina K Bubble Gum Pink ink. Then I grabbed the circles and finished drying them with my heat gun. Then I taped them back into the peek-a-boo openings. I adhered the previously colored die cut cats with fun foam, slid in the wine bottle and adhered everything to a Gina K Bubble Gum Pink card base. I added the pink jewels from Lucy’s Cards, and some Glossy Accents to the wine bottle. Viola, day one down! Day 2 was Magnificent Masking! This card I had to make from scratch, no pre-made pieces. I decided to use Counting Stars and Wishes and Stars for this card, with a masked area for a galaxy. I used Gina K in the Navy cardstock, and torn paper to mask the section in the center. I used Distressed Oxide ink in Seedless Preserves, Faded Jeans and Black Soot to blend the area, and then sprayed it with Mica Spray (Brushed Pewter and Vibrant Turquoise). The sentiments and stars were stamped in Versamark ink and heat embossed in silver. The word stars was die cut from Neenah White Silver cardstock 4 times and layered. The card was finished with Silver Confetti sequins. Day two in the bag. Day three was Background Bonanza! This one was easy! I had all those backgrounds…and images. All I had to do was put the pieces together. I used the background made with Cracked Pistachio, Wilted Violet and Broken China Distress Oxide ink. I used the images and sentiment from Magical Dragons, and they are layered on a vellum panel. I heat embossed the sentiment in white. A couple of purple and blue Lucy’s Cards jewels and done! This one was really quick again. I had the negative space from a card I had made a bit ago with Diagonal Stripes cover up, which had been cut from a Distress Oxide ink background with Worn Lipstick and a tiny bit of Wilted Violet. I filled the die cut spaces with white cardstock. 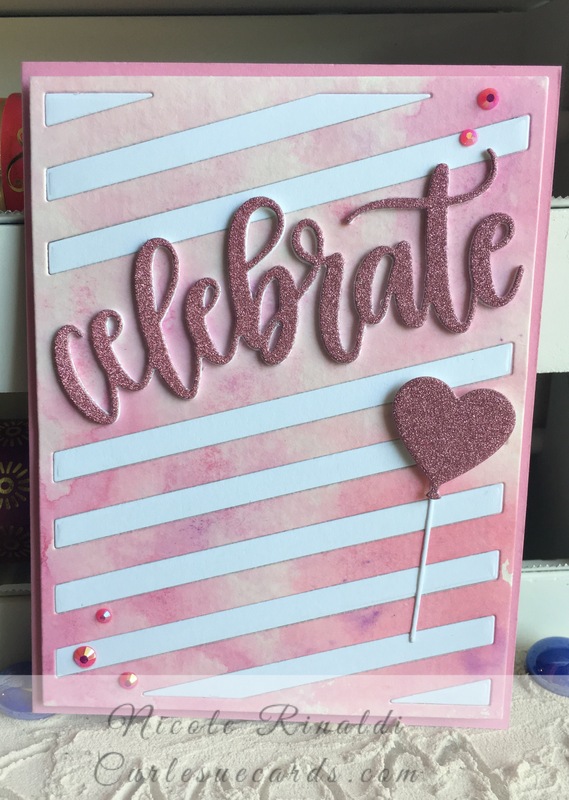 I cut the Celebrate die cut out of Cotton Candy sparkle cardstock and then white a few times and glued it together with a glue pen. I also cut out the Heart Balloon out of the sparkle cardstock. Lucy’s Cards pink jewels accent the card. I left the card blank inside so I could use it for lots of different occasions. The bonfire celebration bonus card is Awesome Ombre! I was inspired by a recent video from Jennifer McQuire for this card. My trusty Otters came to the rescue here. I used Spellbinders Standard Circles dies to emboss circles on a Neenah panel. Then I used the smallest circle that I used to cut out a mask. I think this is Broken China ink that I blended in the circle but I’m second guessing myself now. I started at the bottom and pulled the color up to get the ombre affect. I should have made my mask big enough to cover the whole page, but mine was slightly smaller, and I ended up getting ink on the bottom. I placed the sentiment, which was stamped on Lawn Fawn’s Black Licorice cardstock and heat embossed in white. I used the smallest of Simon Says Stamps Stitched Rectangles to cut it out (I also use the biggest of these rectangles for almost all of my cards). My favorite Lucy’s Cards jewels complete the card. The fifth and final day was Delightful Die Cutting! My recent baby card kick came in here. I had some of the images die cut from LLD Bundle of Baby clothes already on hand. I love this blue color! The sentiment from LLD Welcome Baby was stamped in MFT’s Lush Lagoon. The blue cardstock is Gina K Blue Raspberry. I adhered the baby clothes with foam tape, and some Wink of Stella on the tiny stars and hearts. Silver Confetti sequins accent the sentiment and images. I used a tiny bit of Liquid Pearls and a pin to put dots where the snaps were on the die cut images. And I actually finished Camp Create!!! It was intimidating to take on, but I had fun and the cards went much faster. I’m glad I decided to participate.